Linkout provides a mechanism to link nodes and edges to external web resources within Cytoscape. Right-clicking on a node or edge in Cytoscape opens a popup menu with a list of web links. By default, Cytoscape includes a number of links such as Entrez, SGD and Google, as well as a number of species-specific links. 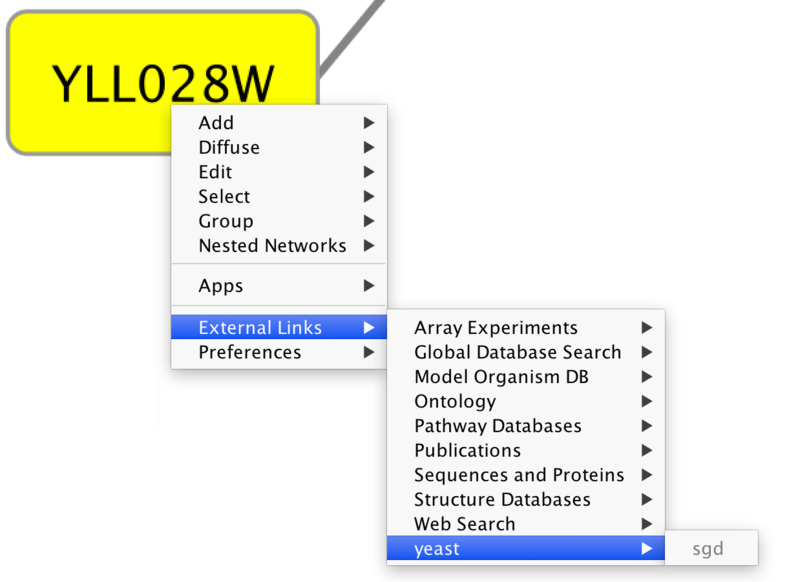 In addition to the default links, users can customize the External Links menu and add (or remove) links by using the Cytoscape Preferences Editor (found under Edit → Preferences → Properties… in the linkout group). External links are listed as ‘key’-‘value’ pairs in the editor where Property Name specifies the name of the link and Value is the search URL. Linkout menus are organized in a hierarchical structure that is specified as part of the key. Linkout key terms specific to nodes start with the keyword nodelinkouturl; for edges this is edgelinkouturl. In a similar fashion one can add new submenus. If you want to query based on a different column, you need to specify a different node label using Styles. For edges the mechanism is much the same; however here the placeholders %ID1% and %ID2% reflect the source and target node label respectively. Currently there is no mechanism to check whether the constructed URL query is correct and if the node label is meaningful. Similarly, there is no ID mapping between various identifiers. 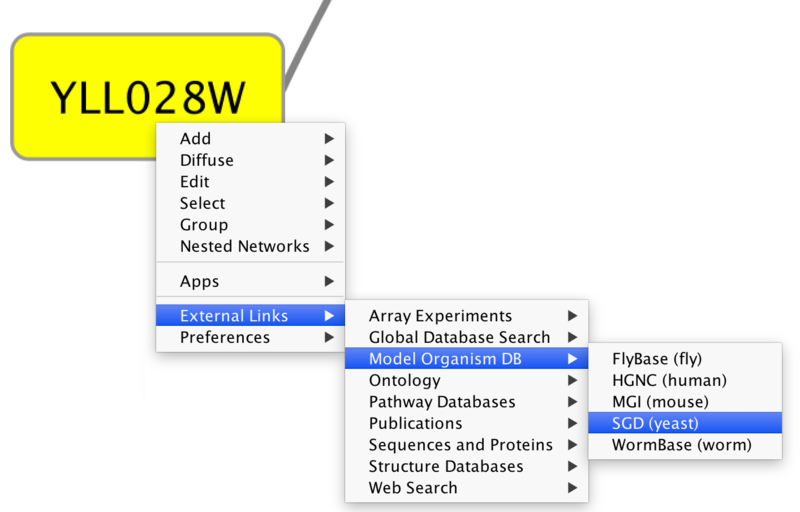 For example, a link to NCBI Entrez from a network that uses Ensembl gene identifiers as node labels will produce a link to Entrez using the Ensembl ID, which results in an incorrect link. It is the user’s responsibility to ensure that the node label that is used as the search term in the URL link will result in a meaningful link. The default links are defined in the linkout.props file contained in the CytoscapeConfiguration directory. 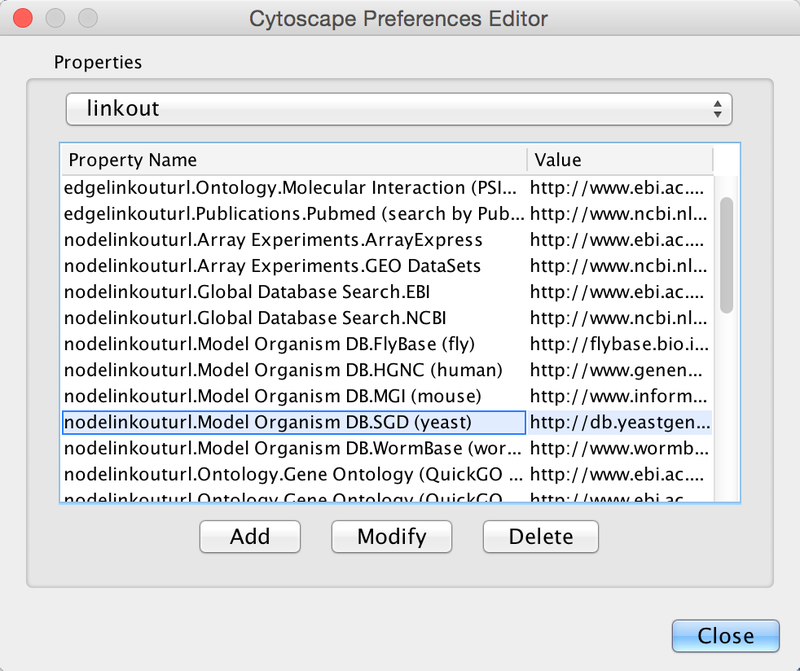 These links are normal Java properties and can be edited directly via text editor or by using the Cytoscape Configuration Editor (Edit → Preferences → Properties…) and selecting linkout (shown below). In addition, new links can be defined when starting Cytoscape from command line by specifying individual properties. The formatting of the command is cytoscape.sh -P [context_menu_definition]=[link]. context_menu_definition specifies the context menu for showing the linkout menu item. The structure of this definition is nodelinkouturl or edgelinkouturl followed by “.” and followed by the “.”-separated menu hierarchy. To remove a link from the menu, simply delete the property using Edit → Preferences → Properties… and selecting commandline. Linkouts added in the command line will be available for the running instance of Cytoscape.